Russia's aerospace forces group in Syria has destroyed a command post of the 'Islamic State' (ISIS) militants in the Aleppo province and a fortified strong point of the same organization in the outskirts of Deir ez-Zor, Russian Defense Ministry spokesman Maj. Gen. Igor Konashenkov told reporters on Oct.26. "A Sukhoi Su-34 bomber conducted a surgical strike near the settlement of Zaitan in the Aleppo province, hitting the ISIL command post exposed by the air intelligence, which coordinated warfare against Syrian government troops near the Qwaires military airport. The facility was completely demolished as a result of a direct hit," Konashenkov said. In addition, a Sukhoi Su-24M bomber has hit the fortified strong point of IS militants near Deir ez-Zor, which was completely destroyed following detonation of the ordnance stored on its territory. Russia's air force unit has hit 285 terrorist facilities in Syria in the last few days, Konashenkov told reporters on Monday. The Russian aerospace forces group in Syria continued its strikes on the facilities of terrorist groups of ISIS and Jabhat al-Nusra, he said. "In the last 72 hours, the planes of the Russian air force group have completed 164 combat missions against 285 objectives of ISIL. 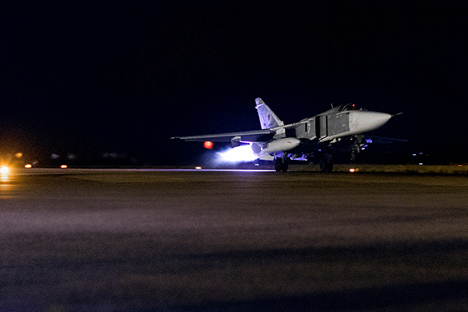 In the last 24 hours, the Russian air force group has completed 59 missions, hitting 94 terrorist targets in the provinces of Hama, Idlib, Latakia, Damascus, Aleppo, Deir ez-Zor," Konashenkov said.